Ask a watch lover to wax lyrical about watch complications and a list of mechanical innovations from chronograph to tourbillon will all invariably deal with either the obsession of capturing time with precision or recording and displaying time’s passage with precision. Inevitably, the many complications we celebrate today all deal with the tangible aspects and perceptions of time rather than the intangible. Given the rise of high precision quartz devices, mechanical watches should have been relegated into the scrap pile of obsolete technology but it hasn’t. Today, the mechanical watch is more art than functionality and yet we still have not shrugged our basic instinct in defining an already transcendent genre – we struggle with technical perspectives and terms like precision and chronometry when already some of us fortunate to own more than one timepiece wear our watches with mal-adjusted dates and sometimes, imprecise times. Our mechanical watches are anachronistic and its place on our wrist does not fulfil its original raison d’etre of time telling. Instead, it is an expression beyond function but one of romance and passion, in this arena, there is no one more cognizant of the fact than Hermes watchmaking. I call it a romantic complication, not to be taken in the same vein as you would a Van Cleef & Arpels poetic complication, but mostly because at La Montre Hermes, time is a dimension not to be tamed or timed but to be enjoyed – the romance of anticipation, the romance of whimsy, the passion of expression – when you kiss, time stretches to an infinity does it not? La Montre Hermes begs you to take time as a companion who follows us on a journey rather than something to keep track off and be chastened by – life as we know it, rushed from event to event, meeting to meeting rather than moments to be cherished and enjoyed. In short, a life romantic. We have grown accustomed to the big PR announcements and the grand hurrahs of each technical accomplishment, yet over at La Montre Hermes watchmaking is not a grand gesture or occasion for self-congratulation, instead, there’s a quiet legitimacy in each accomplishment: Everyone talks about Hermes watchmaking as if it was something recently sprung from money thrown at acquiring legitimacy rather than something earned, they talk about the whimsy and romance of Hermes watchmaking like it was the sum of three watches (it isn’t), there was another and it was a quiet sign of things to come. 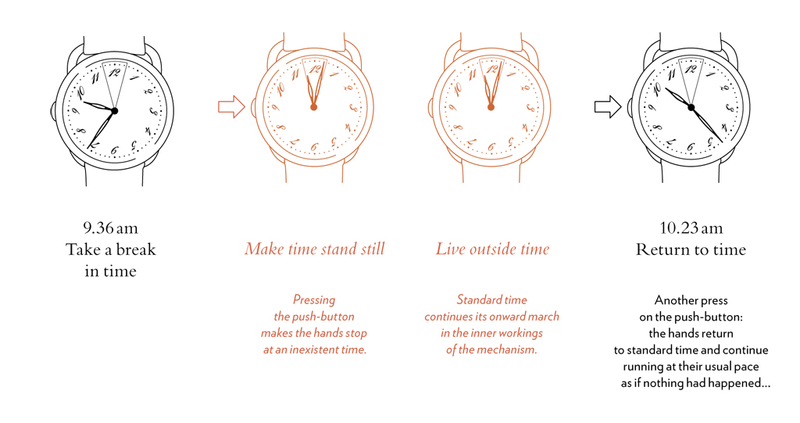 Almost 10 years ago, Hermes was already conceiving of a world of watchmaking which more accurately (ironic I know) addressed our human potential for experiencing time intangibly and imprecisely. Consider the numerous sayings – Time flies when you’re having fun? A watched pot never boils? “Time flies” is a translation from the Latin tempus fugit, a romantic expression that captures the inevitable passing of time and the need to enjoy the time. 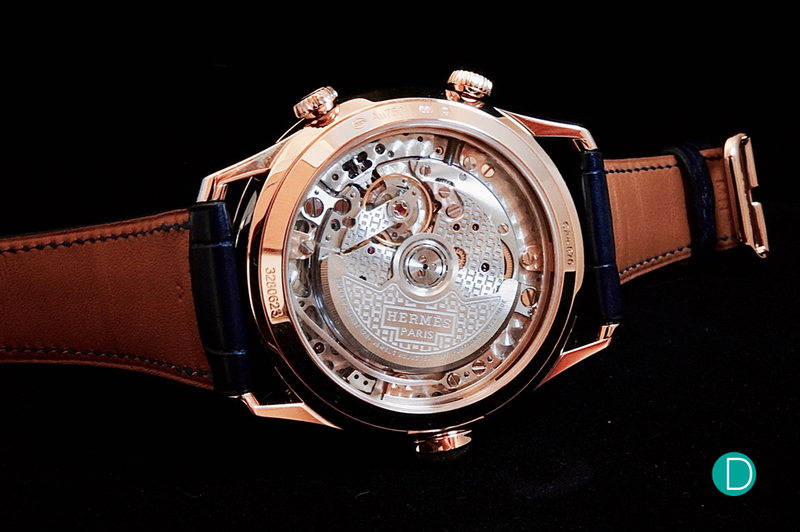 In understanding our fundamental nature as such, Hermes gave us the Cape Cod Grandes Heures Automatic. Notice anything different from your usual watches? The hours are not where they usually are. Nor should they be, because how often has our perception of time sped up or slowed to the emotions of moment? 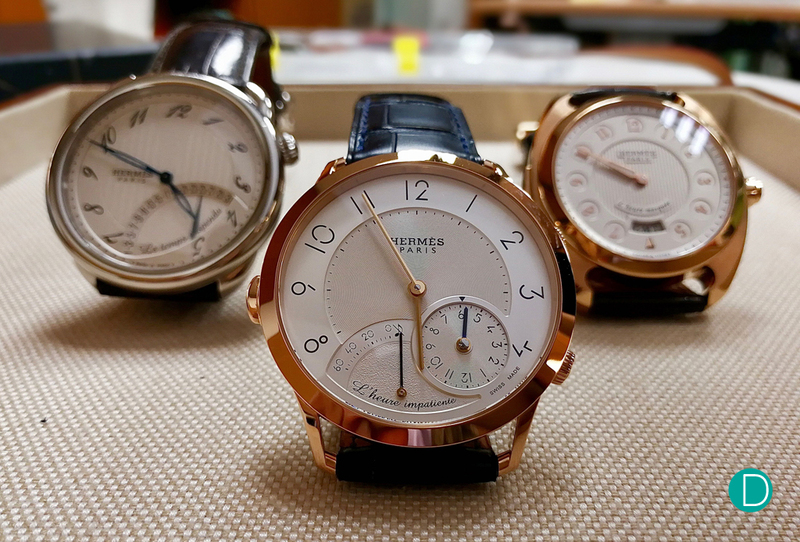 This is what the Hermes Cape Cod Grand Heures captured. Hermes Cape Cod Grandes Heures offers a Swiss made Vaucher calibre which embodies literal, physical expression of tempus fugit. Within the Cape Cod Grandes Heures, Hermes conceptualised and Vaucher conceived of a movement module that at chosen intervals would increase or decrease the angular velocity of hour and minute hands, in essence, speeding up time at times and at others, say between the hours of 2 and 3, slow it down to a metaphorical snail’s pace. In the years that have followed since the Cape Cod Grandes Heures, Hermes watchmaking and their philosophy of whimsy, emotions and romance have permeated almost major collection. 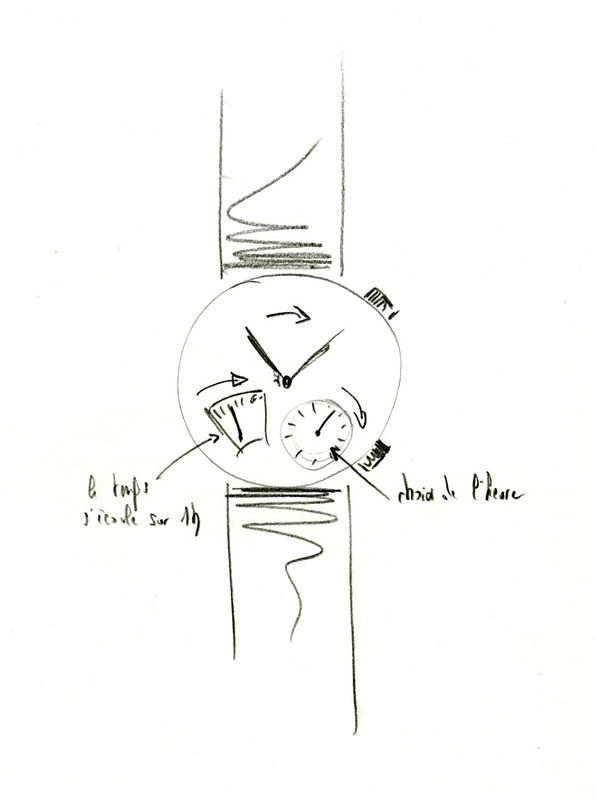 The undisputed maestro in capturing time’s intangible qualities, Hermes would follow their Grandes Heures with the Arceau Le Temps Suspendu, the brand’s second venture into a world they created. Like the watch before it, La Montre Hermes once again overturned the idea of the complication – it didn’t make the watch more precise nor measure time more precisely, nor provide an expansive overview of time’s passage across seasons and leap years, instead, it sought to suspend it – in doing so, La Montre Hermes became a literal god – you could suspend time at any given moment should you so choose. How so? A simple button press would give the hands a spirited independence to point to whatever and wherever it chose. As a result, time is no longer a utilitarian or physical construct, instead, it becomes a purely emotional one – the romance of being in the moment, untethered from time’s passage. Preceded by Le Temps Suspendu, the Dressage L’heure Masquee too played with your perception of time; hiding its hour hand under the minute pointer until you chose to activate a pusher, sliding the hour pointer from out under its minutes hand companion to reveal the time. Once you had let go of the button, the hours hand returns to rest beneath the canopy of minutes. What Temps suspended, L’Heure Masquee focuses your attention to the most important passage of minutes as opposed to entire hours. Time is whatever you choose to reveal when you are ready. Thus, it can be surmised that for La Montre Hermes, the underlying passion is a desire to express the intimate version of time that we know, rather than the type atomic clocks and physicists reckon. Time is what we experience, in a moment, subject to the variable of emotional states it is not to be controlled, measured or summoned. Time, just is whatever you make of it – experience it in infinity by watching paint joy (what horror) or by french kissing a lover (what pleasure) or simply watching ants go about their day in the nest (how curious); for 2017, Hermes introduced another romantic concept – anticipation. 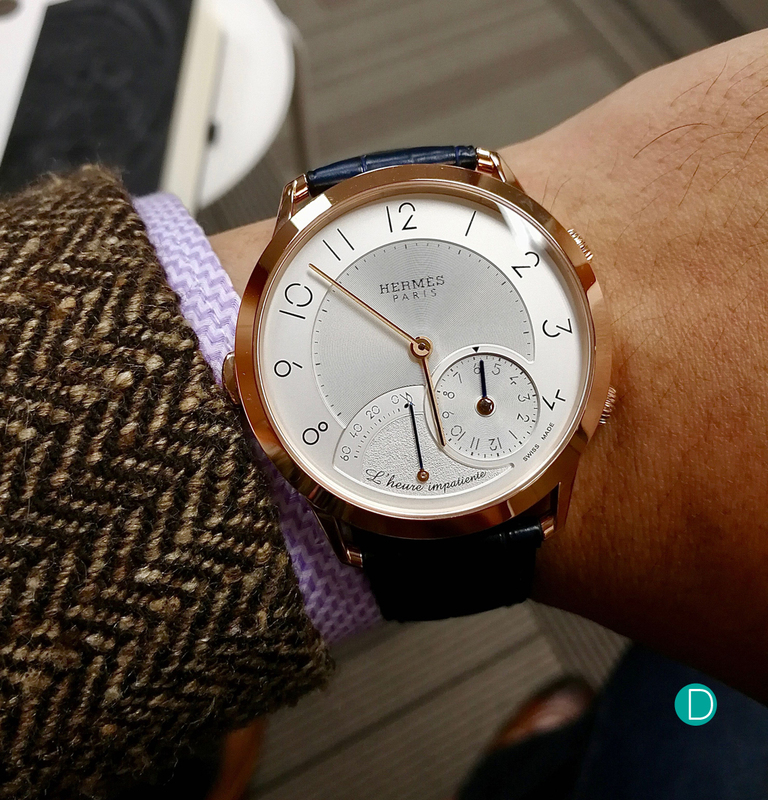 We have all encountered it: at the arrival hall of the airport awaiting loved ones, waiting for delivery of a new watch, the birth of your child – it’s the most pleasurable twinge of discomfort one can have and this philosophy germinates and finds fruition in the Baselworld 2017 Slim d’Hermes L’heure Impatiente; once again, changing how we experience time and grounding it in the idea of the impatience that comes with any length of wait in this modern world of instant self-gratification. Housed in the Slim d’Hermes collection, the brand’s thin line of watches – the L’heure Impatiente or “Impatient Hour” is a chiming watch which forces you to enjoy the painful pleasure of impatience- in short, anticipation. The Grand Heueres celebrated the variability of time, Le Temps Suspendu gave us the power to suspend it, L’heure Masquee was our chance to focus it into a singular minute to minute reckoning; the Slim d’Hermes L’heure Impatiente anchors our expectation of time in the future rather than the present rather than as offered in the previous three romantic complications. 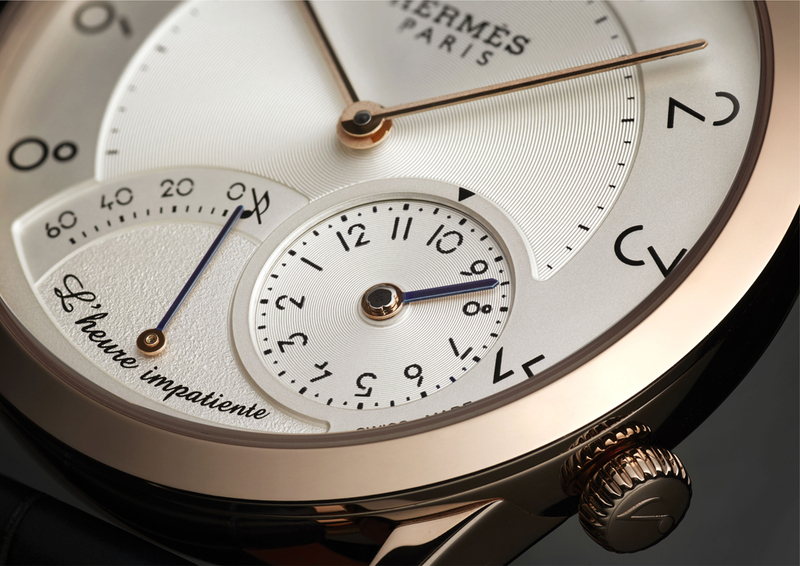 Not a minute repeater but instead closer to an alarm watch, the new Slim d’Hermes L’heure Impatiente allows her owner to enjoy her charms by activating the romantic complication with a pusher at nine o’clock, watching as the retrograde display readies itself, en pointe at 60 in the lower left arc of the dial. You then set the time for that special moment in the future via crown at 4 o’clock. You progress about your day until the hour before the appointed moment. You spy the retrograde hand starts progressing down the arc towards zero. At climax, the L’heure Impatiente chimes – your moment has arrived. While La Montre Hermes enjoys control and partial ownership of the vaunted Vaucher Manufacture, a good number of their romanticised and idealised concepts of time are brought to life by the watchmaking genius Jean-Marc Wiederrecht, recently lauded for his revolutionary new, never-before-seen chronograph calibre. The Impatient Hours complication is a module on top of the base calibre but you can see the gong on the lower portion (according to the way the image is orientated) of the movement. The sketch provided to Wiederrecht from Hermes. Wiederrecht had to work under multiple constraints, first the design of the dial, its indicators and the positions of the crowns and pushers were already pre-determined by Hermes and the needs of meeting the aesthetics complicated how he would conceive of the architecture that would hold both the time setting and chiming function of the “alarm” – more importantly, taking into consideration how often users accidentally damage their minute repeaters, Wiederrecht had to develop a complication which would enduring enough to render it fairly immune to user error. As if the challenge wasn’t difficult enough, Wiederrecht had to do it in the slimmest of all Hermes watch collections – the Slim d’Hermes. As one would be familiar, chiming watches need space to “sound” and so there additional auditory challenges to surmount. Thankfully, the Manufacture Hermes H1912 was slim enough at 3.7mm in height and 23.9mm width to allow Wiederrecht the advantage of space not just for his module but for a large enough gong and hammer to be situated to its periphery with enough space for the required resonance. Lyn Chan, Senior Marketing and Communications Manager for Hermes reminds me that though the chime is only meant for the owner, a singular chime meant that it had to be audible for a long enough time to be heard and not missed – in that endeavour, hammer had to strike the gong hard enough for the metal to reverberate for almost 2 seconds long. As with all timekeeping challenges, power is always an issue – you need it for chronometry but keeping the balance amplitude stable and consistent and now, Wiederrecht would need that very same power to drive a hammer with enough force for you not to experience the anguish of missing the much anticipated moment. 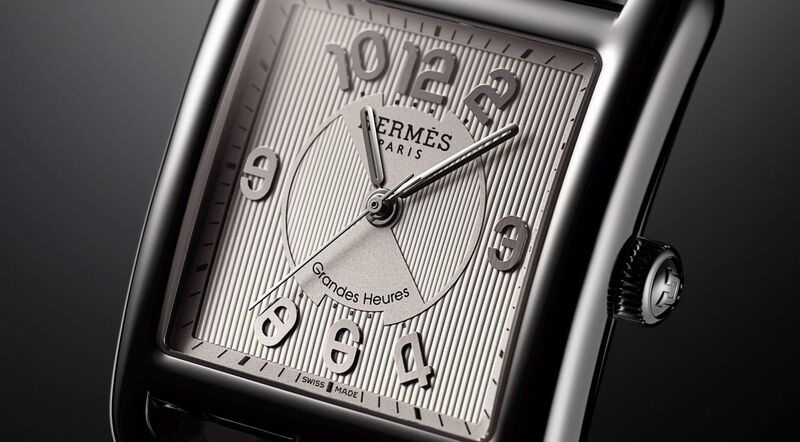 Slim d’Hermes L’heure Impatiente is pleasant to behold and even more enjoyable to experience. Without going into hyperbole (considering that many brands can make tourbillons now, even some which really shouldn’t), anyone can make a watch. For this author, the watchmaking legitimacy must also be found in the ideas of a maison, anyone can re-interpret an existing complication but to do one which is not only heretofore unseen but also offers us a new perspective of time, is something to be desired and admired. Starting from the Grand Heures, watches like the Arcreau Le Temps Suspendu, Dressage L’heure Masquee and now the Slim d’hermes L’heure Impatiente not only show us the intangible, romantic aspects of time but also heralds a new genre of watchmaking, one befitting its transcendent status no longer beholden to something as proletariat as keeping time for the sake of time. 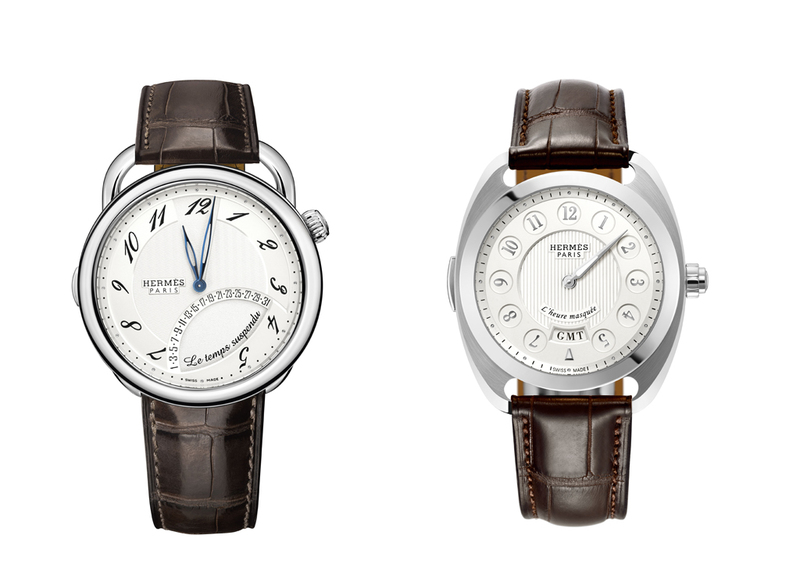 Hermes makes time something to be enjoyed rather than feared or chased by.